This is a very, very old recipe. In fact Syllabub was popular in Britain in the 15th and 16th centuries. It is easy to make and there are so many variations on the recipe that you can make it hundreds of different ways. Syllabub is essentially heavy cream curdled with wine, cider or spirits. It can be flavoured with fruit, herbs or spices as you wish. I chose to make a traditional form of syllabub made with sherry and flavoured with lemon. Here is how I did it. There is a variation on this version of the recipe. Syllabub was originally a drink and later became a dessert. You can make both varieties (as I did). 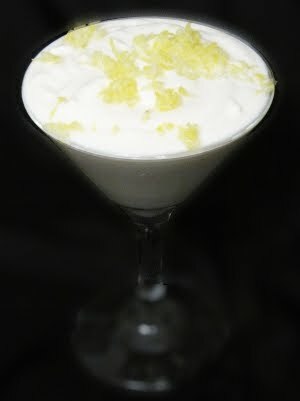 To make the drink variant simply mix unwhipped cream with the sherry/lemon mix and refrigerate it until cold. It is quite delicious made either way. I should warn you that this is not a recipe suitable for people on a health diet. It is chock full of things that taste really good so it must be bad for you. What the heck, eat it anyway then take the dog for a walk to burn off the calories!